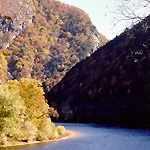 EnviroPolitics Blog: Is the Delaware River Watershed at a tipping point? Is the Delaware River Watershed at a tipping point? Last week, the Delaware River Basin Commission, an interstate agency that oversees water management of the 330-mile river and basin, got some people’s attention when it announced it would begin drafting rules to address natural gas development in the watershed. It sparked a new round in the debate over drilling, also known as fracking. With plentiful supplies of the fuel in Marcellus Shale formations in Pennsylvania and other states, the agency said it would consider imposing a ban on drilling within the basin. But the DRBC also will look at imposing new regulations for allowing the transfer of water for drilling outside the basin — and how wastewater from those drilling operations is handled in the watershed. Both environmentalists, who long have lobbied for such a ban, and industry officials panned the announcement. At a seminar on the watershed, sponsored by NJ Spotlight and StateImpact on Friday in Camden, Maya van Rossum, the Delaware Riverkeeper, called “wholly inappropriate’’ any move to transfer water from the basin for drilling for the fossil fuel. If the water resources are to be protected, others on the panel argued more focus needs to be placed on what is happening on land located within the 13,539 square-mile basin, particularly in its upper portions where its headwaters are.